Yonkers, I’m sure, gets a bad rap. It’s just north of New York City and in Westchester County but it isn’t the Westchester most think of. I don’t know the city other than having done one shoot there a few years ago. The kids I worked with then were great. Beyond that Yonkers is the right angle you make going from the Sawmill River Parkway to the Cross County or vice versa. You are not really seeing Yonkers at that point but if you are moving south and driving at night, you come over a large hill and voilà – there is a valley in front of you, the near side of the ridge which overlooks the Hudson, and a multitude of lights spread before you. I don’t know how long we have been doing it but SOP as you come over the hill is to say, “Yonkers, city of lights,” knowing full well it’s no Paris. Monday night, with a layover between two legs of an architecture assignment and a sunrise call for leg two, it made sense to spend the night. So, Yonkers it was – at a new hotel on top of the ridge, in one of those bizarre office parks which can’t seem to pick an identity. View from my room. Yonkers, NY, August 16, 2010. Click to enlarge. It was impossible to miss this tower at the top of the hill. 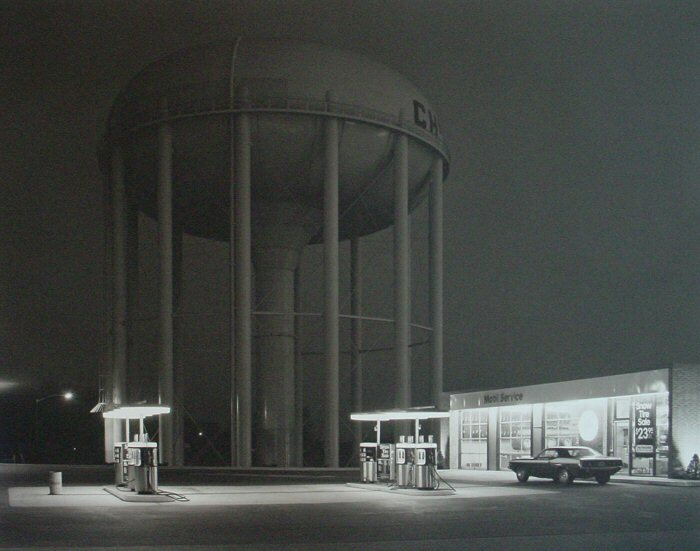 Seeing it with the gas station at its feet I immediately thought of George Tice’s photo, Petit’s Mobil Station. 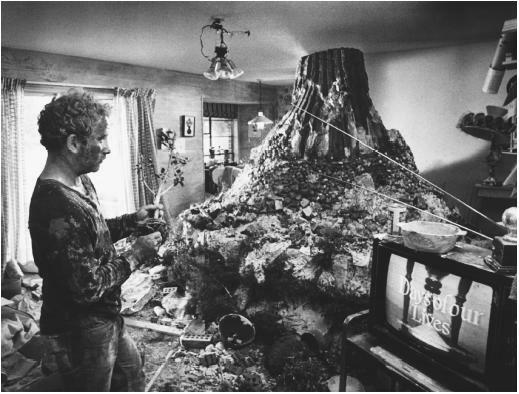 Not wanting to copy that but drawn to the tower like Richard Dreyfuss in Close Encounters I began to plot my move. A thunderstorm then rolled in, the window in my hotel room would not open more than 4″, so I made the best of it. I don’t know if that’s a water tower. I don’t know if the cabling is to pull up a modesty cloth so it can be painted in peace. The cabling made it reminiscent of the Parachute Jump in Coney Island. Maybe the tower, like the office park, still needs to pick an identity.